Pymp Tyte is a duo from the southside of Houston, TX. 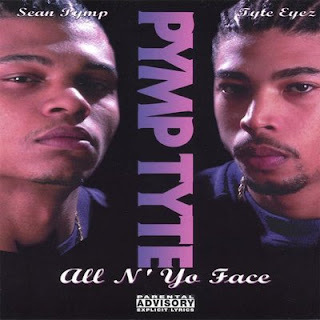 The two rappers are Sean Pymp and Tyte Eyez. All N' Yo Face is their debut album and it was released in 1999 on Wreckshop Records. Production was handled by the notorious Platinum Souls, which consists of Double D, Noke D and Chicken Hawk. The beats are certainly banging on this one. Platinum Souls help gave the album its' southern twang. Both the rappers can spit. Their lyrics are fast paced and display diverting rhyme schemes. Featuring on the album is Fat Pat, R.A.W., 3-2, Hawk, Big Steve, South Park Mexican, Big Pokey, E.S.G., Dirty $, Noke D, Lil' 2 Ach, D-Reck, Nutty Black, Double D and Ronnie Spencer. A jamming record overall that has the ability to play itself out. This happened to be the duo's only album, although they made numerous appearances on other records from the south.